OH, Boy this is fun and looks really cool. If you haven’t tried it I suggest you do it’s so simple to do. I don’t have the photo but, I did it on my toes as well. 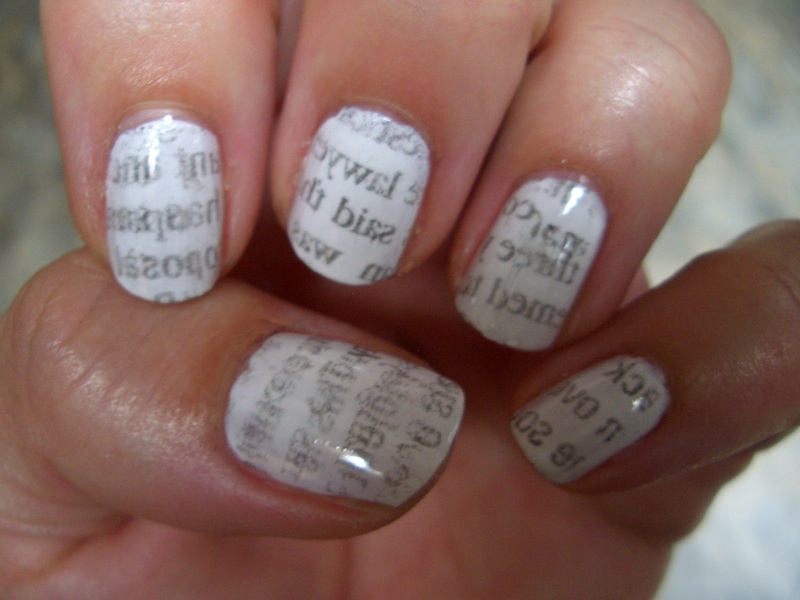 I am now looking for other newspaper print in different languages, perhaps cartoon nails, crossword nails. So, stay tuned and check out my latest. This base color polish was light grey by sallyhansen.com I used Insta -Dri. This must be completely dry before you add-on the newspaper. I used rubbing alcohol, some use water. First, cut all 10 pieces for your nails and about the same size as your nail beds. 1 inch by 1 inch or so. Dip your paper one at a time into the alcohol and place onto your nail. Don’t move it as it will smudge, press hard for a few seconds and then remove slowly. Go to the next nail. I did all my left hand first then, once dried, I painted two coats of top coat. Once that was dry I did my right hand with newspaper print. You will need to sent the print with top coat as it will come off and ruin the design. As you can see it smudges easily.